Bedtime stories have played a pivotal role in shaping our development process as children. One of the most beautiful early memories for a child is snuggling with a parent, and listening to all the heroic and entertaining bedtime stories. Reading to children not only increases bonding between the parents and kids but also has widely accepted advantages and benefits. Reading to your child enhances their vocabulary, builds their understanding of different topics and the most important of all, polishes their creativity as the child can imagine how the story proceeds. However, the sad truth of life is that not every child is blessed with this privilege. For millions of children, the culture of books and reading for joy in their home environment does not exist. This is where NGOs and CSR activities come into the picture and hold the potential of making this world a better place to live in. While environmental CSR activities are one way for companies to give back to nature, however, social activities involving underprivileged children help companies contribute to the economic and social growth of the society. The idea behind the “Missed Call Do, Kahaani Suno” campaign was to give children from lesser privileged homes the joy of a simple story in a language of their choice. Everybody has a story to tell, all you need is time, ears and a missed call. Yes, a missed call! Pratham Books, a not-for-profit publishing house along with Exotel and Radio Mirchi partnered together and launched the first leg of the campaign, “Missed Call Do, Kahaani Suno” in Uttar Pradesh. The partnership between Pratham books, who dreams to see a country where every child wants to read, can read and has something good to read, and Exotel was the perfect catalyst to achieve this. Thanks to technology invasion, almost everyone has a mobile phone now. While purchasing storybooks is not something that everyone can afford, a missed call is not much of a hassle and costs nothing. Hence,’ Missed Call do Kahani Suno’ campaign was initiated. The campaign kick-started with Radio Mirchi assisting in recording the Pratham Books’ stories, and then Exotel created the framework by releasing a number, where the children would give a missed call to listen to the stories. This brilliant campaign saw over 35,000 missed calls from 3,500 phones in just the Delhi region. The teachers in community centres demonstrated to the students how simple it was to give a missed call from their parents’ mobile phone and receive a story in return. The kids were given a sticker with the number to give a missed call on. When they dialled this number, the child would get a call back with an IVR being played to them. After the child selects the language of their choice, they would then have a story read out to them. The kids were given a choice to listen to a story in one of the five languages – Marathi, English, Hindi, Kannada and Telugu. The campaign didn’t end with just the story. The callers also received an SMS with a link to the e-book on StoryWeaver. Overwhelmed by the immense response received, the campaign was continued and promoted through social media. During this leg of the campaign, the phone number went viral. In addition to platforms like Facebook & Twitter, we even had people forwarding this number on WhatsApp. “My favourite moment was when a father read the placard, gave a missed call, heard the story — and had the widest smile I had seen in the longest time. The first thing he said was ‘I’ll go home and ask my daughter to listen to a story in Hindi and English. She loves stories and she is learning English too.’” – a volunteer for the campaign. Some volunteers took the campaign one step ahead, printed the placard with the campaign phone number on it and attached it to their backpack. Missed Call Do Kahani Suno, apart from being a beautiful campaign that helped us in making a small difference in lives of children by giving that power to imagine through stories, taught us something else too- the power of the platform. 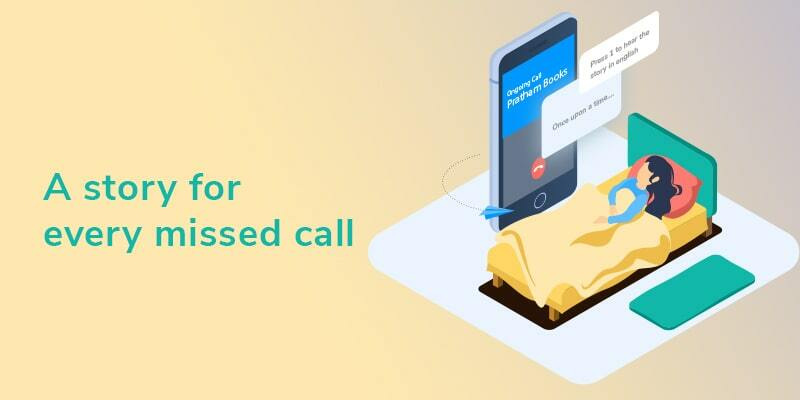 Missed Call do Kahani suno is an example of how cloud communication as a platform can be used for the interests of the common man and not just businesses. We love stories, we love children, and this project is a perfect combination of both. 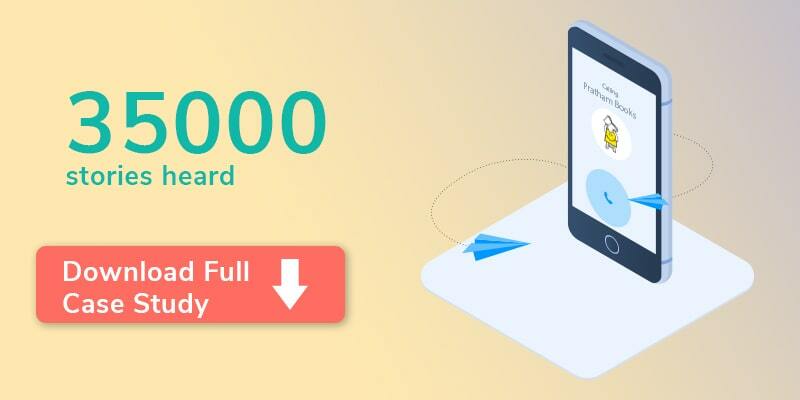 This was our first public-spirited project, and though we’ve worked on many such campaigns after this, this one still remains close to our heart. 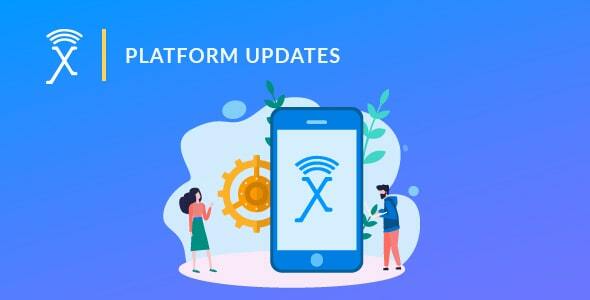 Exotel has always prided in using communication services for educating, informing and creating projects that forge a deeper meaning to the company’s values and objectives.